The view was worth the trip. Battling high winds, cold temperatures, and low oxygen, the trek to near the top of the volcano Santa Maria in Guatemala -- while carrying sensitive camera equipment -- was lonely and difficult. Once set up, though, the camera captured this breathtaking vista during the early morning hours of February 28. 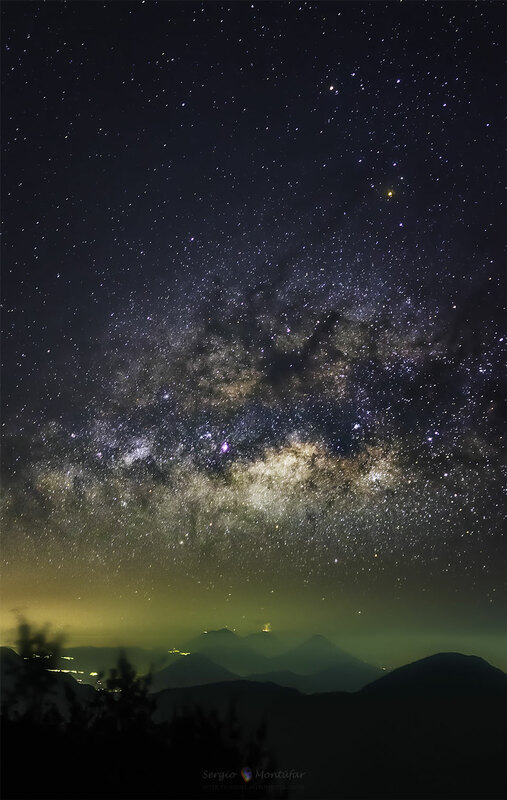 Visible on the ground are six volcanoes of the Central America Volcanic Arc, including Fuego, the Volcano of Fire, which is seen erupting in the distance. Visible in the sky, in separate exposures taken a few minutes later, are many stars much further in the distance, as well as the central band of our Milky Way Galaxy situated horizontally overhead. Why is Saturn partly blue? The above picture of Saturn approximates what a human would see if hovering close to the giant ringed world. The above picture was taken in 2006 March by the robot Cassini spacecraft now orbiting Saturn. Here Saturn's majestic rings appear directly only as a thin vertical line. The rings show their complex structure in the dark shadows they create on the image left. Saturn's fountain moon Enceladus, only about 500 kilometers across, is seen as the bump in the plane of the rings. The northern hemisphere of Saturn can appear partly blue for the same reason that Earth's skies can appear blue -- molecules in the cloudless portions of both planet's atmospheres are better at scattering blue light than red. When looking deep into Saturn's clouds, however, the natural gold hue of Saturn's clouds becomes dominant. 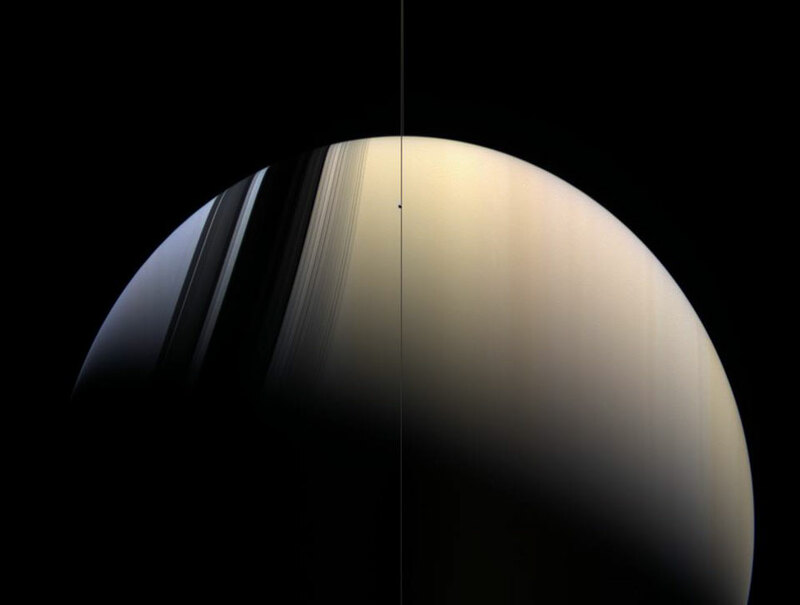 It is not known why southern Saturn does not show the same blue hue -- one hypothesis holds that clouds are higher there. It is also not known why Saturn's clouds are colored gold. This week the Sun gave up its strongest solar flare so far in 2013, accompanied by a coronal mass ejection (CME) headed toward planet Earth. 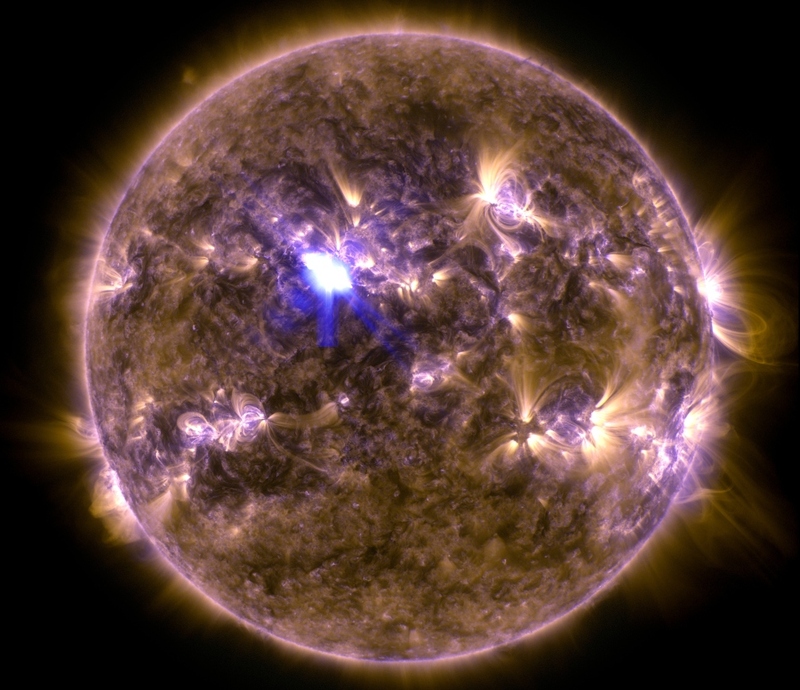 A false-color composite image in extreme ultraviolet light from the Solar Dynamics Observatory captures the moment, recorded on April 11 at 0711 UTC. The flash, a moderate, M6.5 class flare erupting from active region AR 11719, is near the center of the solar disk. Other active regions, areas of intense magnetic fields seen as sunspot groups in visible light, mottle the surface as the solar maximum approaches. Loops and arcs of glowing plasma trace the active regions' magnetic field lines. A massive cloud of energetic, charged particles, the CME will impact the Earth's magnetosphere by this weekend and skywatchers should be on the alert for auroral displays. It was late in the northern martian spring when the HiRISE camera onboard the Mars Reconnaissance Orbiter spied this local denizen. Tracking south and east (down and right) across the flat, dust-covered Amazonis Planitia the core of the whirling dust devil is about 30 meters in diameter. Lofting dust into the thin martian atmosphere, its plume reaches more than 800 meters above the surface. Not following the path of the dust devil, the plume is blown toward the east by a westerly breeze. Common in this region, dust devils occur as the surface is heated by the Sun, generating warm, rising air currents that begin to rotate. 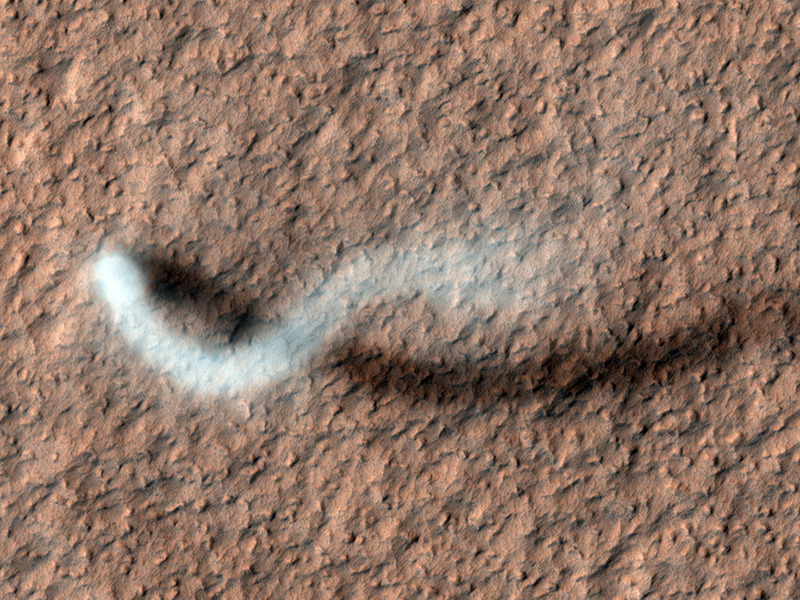 Tangential wind speeds of up to 110 kilometers per hour are reported for dust devils in other HiRISE images. What if you could see the huge radio jets of Centaurus A rising? The Cen A radio jets are not only over a million light years long, they occupy an angular area over 200 times greater than the full Moon in Earth's sky. The jets are expelled by a violent black hole millions of times the mass of our Sun embedded deep in the center of nearby active galaxy Cen A. Somehow, the black hole creates the fast moving jets as other matter falls in. 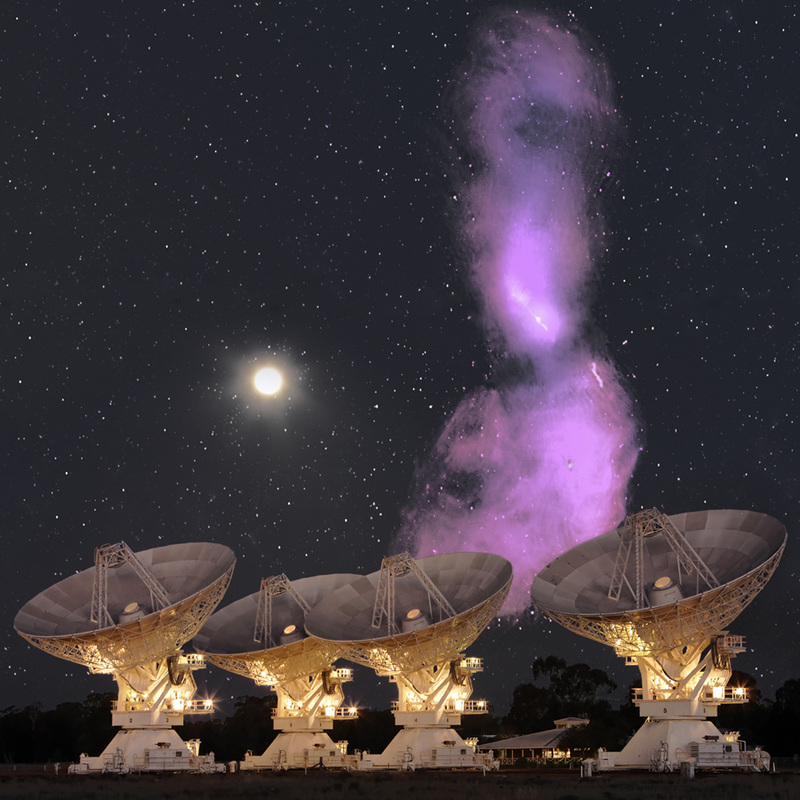 In this picture, radio telescopes from the Australian Telescope Compact Array (ATCA) near Narrabri, NSW, Australia, were captured in front of a full Moon, with a radio image of Cen A superposed at its real angular size in the background. The above picture includes the most detailed map yet of any galaxy-class radio jets in the universe, taking several years and over 1,000 hours exposure time to complete. Details in the photo may yield clues as to how radio jets interact with stars and intergalactic dust. The light dots in the image depict not stars, but typically other radio bright galaxies in the even more distant universe. 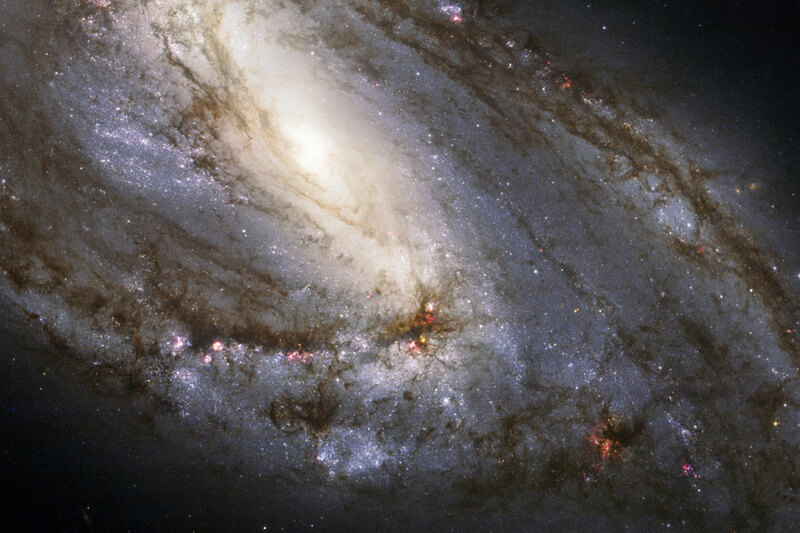 Why isn't spiral galaxy M66 symmetric? Usually density waves of gas, dust, and newly formed stars circle a spiral galaxy's center and create a nearly symmetric galaxy. The differences between M66's spiral arms and the apparent displacement of its nucleus are all likely caused by previous close interactions and the tidal gravitational pulls of nearby galaxy neighbors M65 and NGC 3628. Spiral galaxy M66, pictured above, spans about 100,000 light years, lies about 35 million light years distant, and is the largest galaxy in a group known as the Leo Triplet. Like many spiral galaxies, the long and intricate dust lanes of M66 are seen intertwined with the bright stars and nebulas that light up the spiral arms. Just fix your camera to a tripod and you too can make an image of graceful trails traced by the stars as planet Earth rotates on its axis. Making a time lapse video like that shown above may require more effort, though. Made on 2006 October 13 from Mauna Kea, Hawaii, USA, this video nicely captured what you might see of the night sky if you could keep your brain from changing your perceived visual image about every hundredth of a second. Starting from a dark sky and point-like stars, the video demonstrates how stars appear to move over the night as the world turns. Near the center of the developing bull's-eye pattern is Polaris, the North Star. Visible in the left foreground is the 3.7-meter aperture Canada-France-Hawaii Telescope (CFHT). The red glow that illuminated the CFHT dome near the beginning of the film was created by a car leaving the volcanic summit. The Moon rose about half way through the video and created a white glow that gradually illuminated most of the CFHT dome. The above remarkable time-lapse video was constructed from about 1,000 consecutive frames taken with a digital camera over nearly nine hours. What causes unusual knots of gas and dust in planetary nebulas? Seen also in the Ring Nebula, the Dumbbell Nebula and the Eskimo Nebula, the knots' existence was not initially predicted and their origins are still not well understood. Pictured above is a fascinating image of the Helix Nebula by the Hubble Space Telescope showing tremendous detail of its mysterious gaseous knots. The above cometary knots have masses similar to the Earth but have radii typically several times the orbit of Pluto. One hypothesis for the fragmentation and evolution of the knots includes existing gas being driven out by a less dense but highly energetic stellar wind of the central evolving star. The Helix Nebula is the closest example of a planetary nebula created at the end of the life of a Sun-like star. The Helix Nebula, given a technical designation of NGC 7293, lies about 700 light-years away towards the constellation of Aquarius. Hurtling through a cosmic dust cloud a mere 400 light-years away, the lovely Pleiades or Seven Sisters star cluster is well-known in astronomical images for its striking blue reflection nebulae. 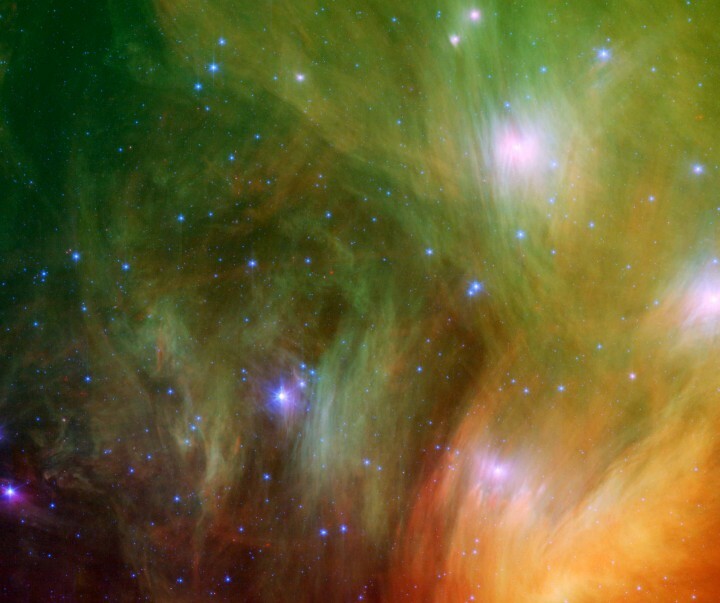 At visible wavelengths, the starlight is scattered and reflected by the dust, but in this portrait in infrared light by the Spitzer Space Telescope, the dust itself glows. The false color image spans about 1 degree or seven light-years at the distance of the Pleiades, with the densest regions of the dust cloud shown in yellow and red hues. Exploring this young, nearby cluster, the Spitzer data have revealed many cool, low mass stars, brown dwarfs or failed stars, and possible planetary debris disks. Want to see the Pleiades tonight? Look near Venus, the brilliant evening star in the west just after sunset. Located some 7,000 light-years away toward the constellation Perseus, this pair of open or galactic star clusters really is visible to the unaided eye and was cataloged in 130 BC by Greek astronomer Hipparchus. Now known as h and chi Persei (NGC 869/884), the clusters themselves are separated by a few hundred light-years and contain stars much younger, and hotter than the Sun. But what if this famous double star cluster were closer, say only 700 light-years distant from our fair solar system, crowding our sky with stars? Astrophotographer Jose Suro also imagines a clear, moonless, dark night sky on a warm evening near tranquil waters. 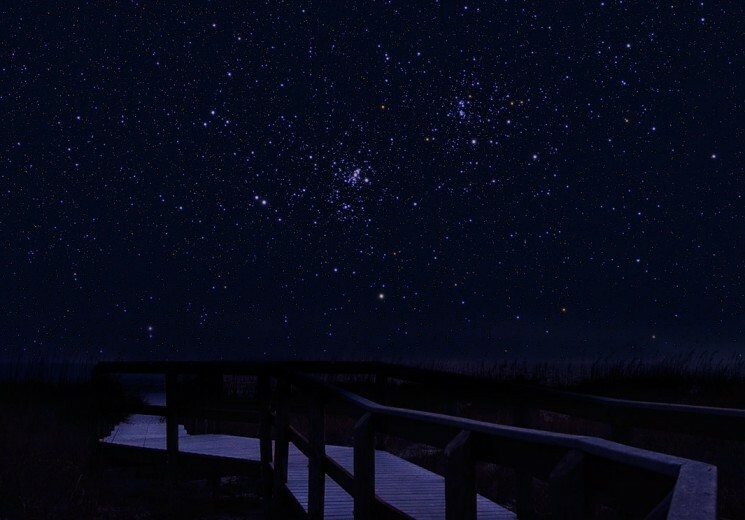 The foreground is illuminated by starlight in his composited dreamlike image of the cluster pair. He notes that while the solar system is not in the vicinity of such rich clusters of stars, dark night skies and warm evenings can still be inspiring on planet Earth. If there were a window nearby to the distant universe -- would you look through it? Quite possibly, there is, in the form of a small telescope. A local skykeeper could be a relative or a stranger and is frequently proud to show off the sky free of charge. Through a window called an eyepiece, on a dark cloudless night, you can see clusters of stars, rings around Saturn, glowing nebulas of gas, craters on the Moon, and galaxies across the universe. The technology to create this window -- and the secret sky it reveals -- was unknown only 400 years ago. Modern sky opportunities may occur this Saturday, Astronomy Day, at local amateur astronomy clubs, universities, science centers, or planetariums. 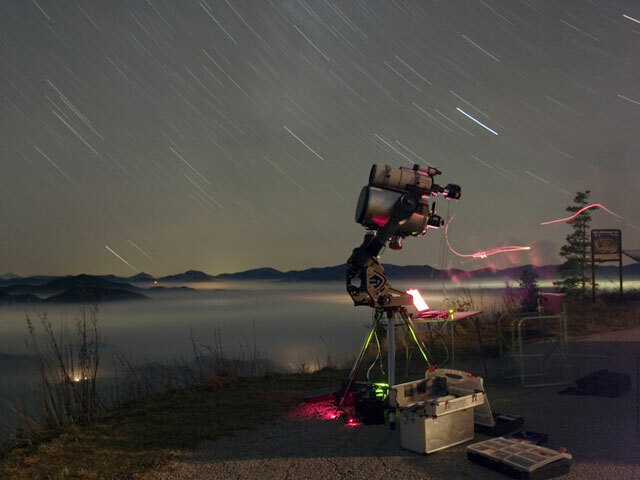 Pictured above is a small telescope being deployed at picturesque Hohe Wand, about 50 kilometers south of Vienna, Austria. The spin of the Earth is visible in the above photo as the long star trails. Why would a cloud appear to be different colors? A relatively rare phenomenon known as iridescent clouds can show unusual colors vividly or a whole spectrum of colors simultaneously. 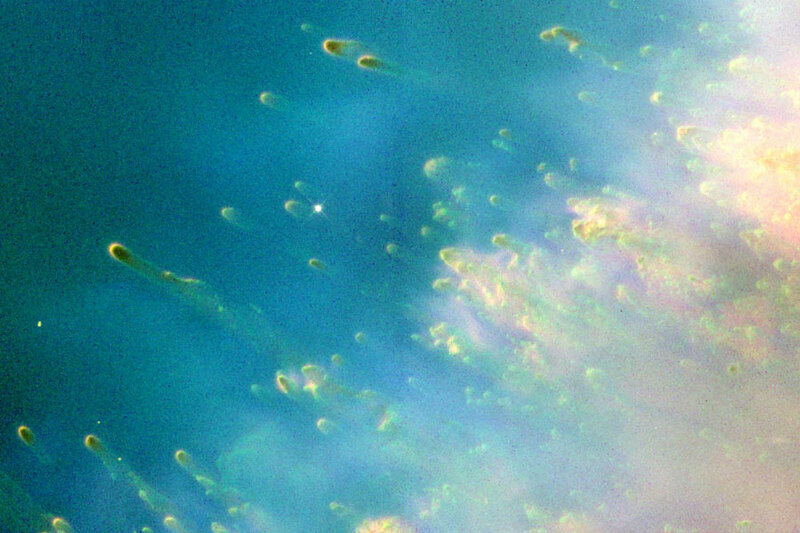 These clouds are formed of small water droplets of nearly uniform size. When the Sun is in the right position and mostly hidden by thick clouds, these thinner clouds significantly diffract sunlight in a nearly coherent manner, with different colors being deflected by different amounts. Therefore, different colors will come to the observer from slightly different directions. Many clouds start with uniform regions that could show iridescence but quickly become too thick, too mixed, or too far from the Sun to exhibit striking colors. 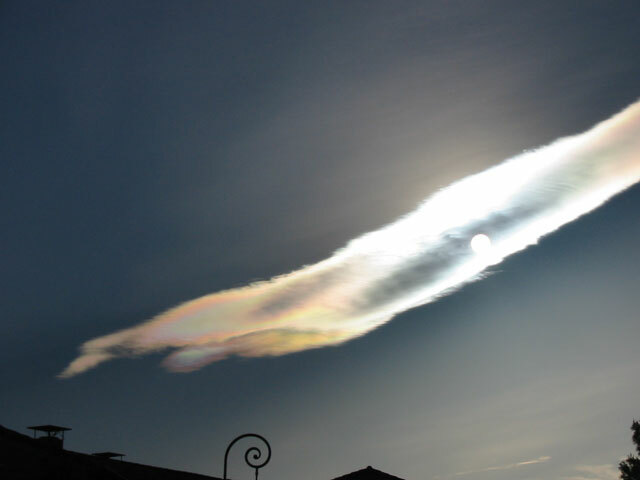 Pictured above, an iridescent cloud was photographed near Cannes, France last month. Many spiral galaxies have bars across their centers. Even our own Milky Way Galaxy is thought to have a bar, but perhaps not so prominent as the one in NGC 1365, shown above. The persistence and motion of the bar imply relatively massive spiral arms. The placements of bright young blue stars and dark dust lanes also indicate a strong rotating density wave of star formation. 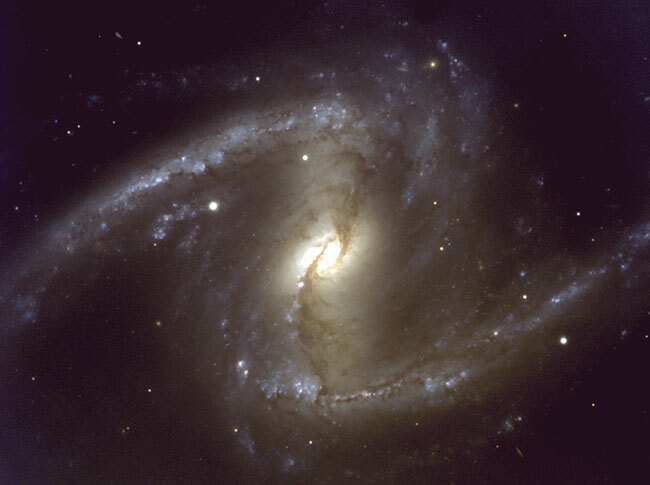 NGC 1365 is a member of the Fornax Cluster of Galaxies. Because NGC 1365 is relatively nearby, simultaneous measurements of its speed and distance are possible, which help astronomers estimate how fast our universe is expanding. 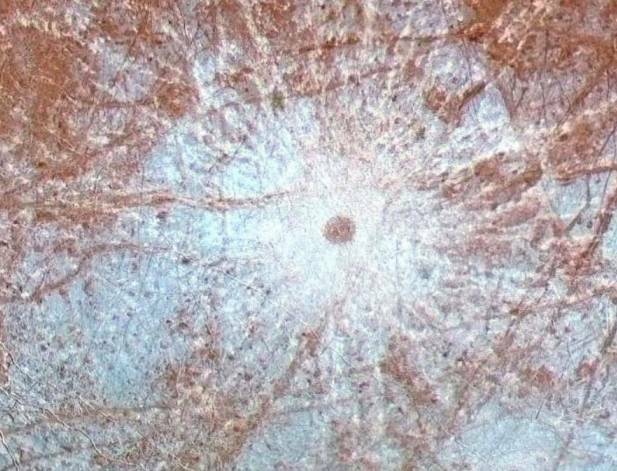 The impact crater Pwyll (a name from Celtic Mythology) is thought to represent one of the youngest features on the surface of Jupiter's moon Europa. A combination of color and high resolution black and white data from NASA's Galileo spacecraft was used to produce this view looking down on the crater with the sun illuminating the scene from the right. Pwyll's visible dark central region is about 26 kilometers in diameter, while brilliant white rays of debris blasted from the impact site extend outward for hundreds of kilometers. The white debris or ejecta clearly overlays everything else on the surface - indicating that this impact crater is younger than all surrounding features. The bright white color suggests a composition of water ice particles. Galileo's instruments have uncovered substantial evidence that water in liquid form exists below Europa's icy surface. If Europa has a subsurface ocean, could it harbor life? A fading afterglow from one of the most powerful explosions in the universe is centered in this false color image from the spacebased Chandra X-ray Observatory. The cosmic explosion, an enormously bright gamma-ray burst (GRB), originated in a galaxy billions of light-years away and was detected by the BeppoSAX satellite on February 22. 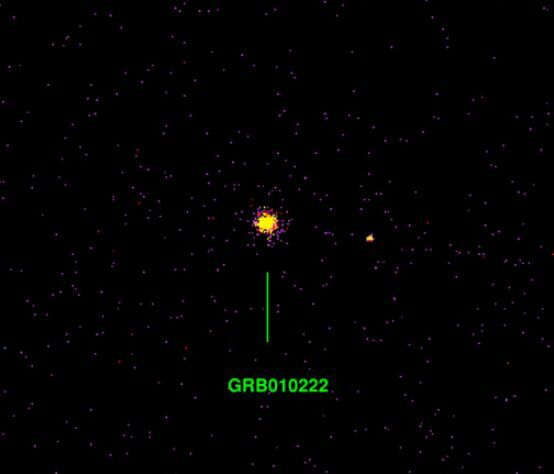 GRB010222 was visible for only a few seconds at gamma-ray energies, but its afterglow was followed for days by x-ray, optical, infrared and radio instruments. 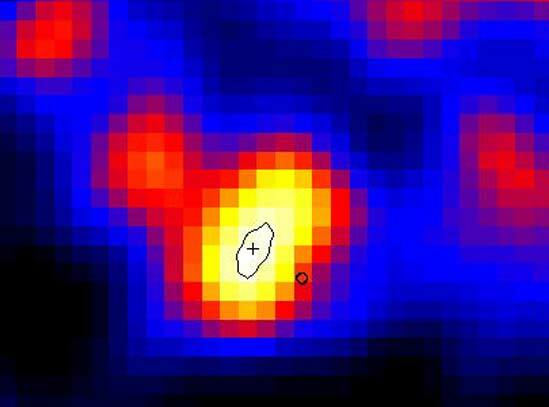 These Chandra observations of the GRB's x-ray glow hours after the initial explosion suggest an expanding fireball of material moving at near light speed has hit a wall of relatively dense gas. While the true nature of gamma-ray bursters remains unknown, the mounting evidence from GRB afterglows does indicate that the cosmic blasts may be hypernovae -- the death explosions of very massive, short-lived stars embedded in active star forming regions. As the hypernova blasts sweep up dense clouds of material in the crowded star forming regions they may also trigger more star formation. 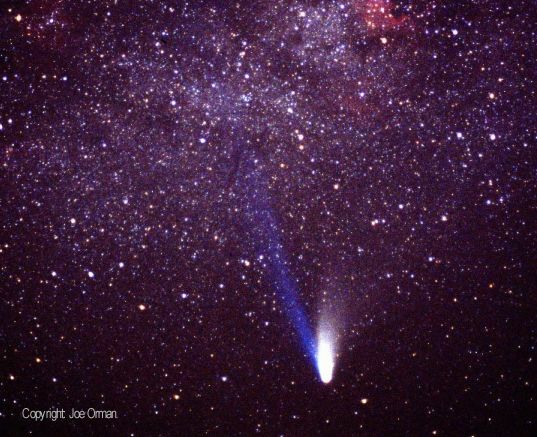 Comets are known for their tails. In the spring of 1997 and 1996 Comet Hale-Bopp (above) and Comet Hyakutake gave us stunning examples as they passed near the Sun. These extremely active comets were bright, naked-eye spectacles offering researchers an opportunity to telescopically explore the composition of primordial chunks of our solar system by studying their long and beautiful tails. But it has only recently been discovered that surprising readings from experiments on-board the interplanetary Ulysses probe which lasted for several hours on May 1, 1996, indicate the probe passed through comet Hyakutake's tail! Ulysses experiments were intended to study the Sun and solar wind and the spacecraft-comet encounter was totally unanticipated. Relative positions of Ulysses and Hyakutake on that date indicate that this comet's ion tail stretched an impressive 360 million miles or about four times the Earth-Sun distance. This makes Hyakutake's tail the longest ever recorded and suggests that comet tails are much longer than previously believed. Would you notice a second Moon in the sky? About 700 years ago, light from a tremendous explosion reached Earth that should have appeared almost as bright as a full Moon. The bright spot should have lasted for weeks, yet no notation of such an occurrence has been found in historical records. The mystery was uncovered by Wan Chen and Neil Gehrels (NASA/GSFC) when studying the source of radioactive elements toward the Vela supernova remnant. They deduced that an explosion much younger and closer than the supernova that caused Vela must have occurred, and even computed explosion characteristics from the amounts of radioactive elements present. They calculate that GRO/RX J0852 should have dazzled medieval stargazers. Perhaps people were too busy, surviving records are too incomplete, or the explosion was somehow too dim. The above picture of GRO/RX J0852 was taken in gamma-ray light with the Compton Gamma-Ray Observatory and is shown in false-color. Astronomers and historians continue to contemplate the clues. Our Sun changes every day. This recent picture was taken in a very specific red color called Hydrogen-Alpha. Dark spots that might appear on the image are usually sunspots, dark magnetic depressions that are slightly cooler than the rest of the Sun's surface. Bright spots that might appear are usually plages, active regions that are slightly hotter than the rest of the Sun's surface. Over the next few years the average number of sunspots and plages will increase until "Solar Maximum" occurs in 2001. The Sun usually goes through a maximum and minimum every 11 years. From 1645 to 1715, however, almost no sunspots at all were recorded, for reasons unknown. SS433 is one of the most exotic star systems known. Its unremarkable name stems from its inclusion in a catalog of stars which emit radiation characteristic of atomic hydrogen. Its very remarkable behavior stems from a compact object, a black hole or neutron star, which has produced an accretion disk with jets. As illustrated in this artist's vision of the SS433 system based on observational data, a massive, hot star (left) is locked in a mutual orbit with a compact object. Material transfers from the massive star into an accretion disk surrounding the compact object blasting out two jets of ionized gas in opposite directions - at about 1/4 the speed of light! Radiation from the jet tilted toward the observer is blueshifted, while radiation from the jet tilted away is redshifted. The binary system itself completes an orbit in about 13 days while the jets precess (wobble like a top) with a period of about 164 days. Are the jets from SS433 related to those from black holes at the centers of galaxies? Earlier this April, NASA's Compton Gamma Ray Observatory, completed its fifth successful year in orbit, exploring the gamma ray sky. Pictured is astronaut Jay Apt perched in the shuttle payload bay below the massive observatory. Compton is the largest civilian instrument ever flown - the whole observatory is roughly the size of a school bus. Apt and colleague Jerry Ross rescued the spacecraft from an unexpected problem by successfully freeing the stuck high gain antenna in an unplanned space walk. The second of NASA's planned Great Observatories for Space Astrophysics, the first being the Hubble Space Telescope, the Compton Gamma Ray Observatory has exceeded expectations of scientific discovery. Compton continues to search the depths of the universe for such high energy phenomena as gamma-ray bursts, blazars, and pulsars. Compton is still monitoring a new source it discovered just last December - the spectacular "bursting pulsar" near the center of our Galaxy.